A beautiful toy for any child to treasure, hand knitted in softest lambswool and personalised with your chosen initial. Stripy Rabbit has a cute pompom tail on his bottom and vintage fabric ear patches. 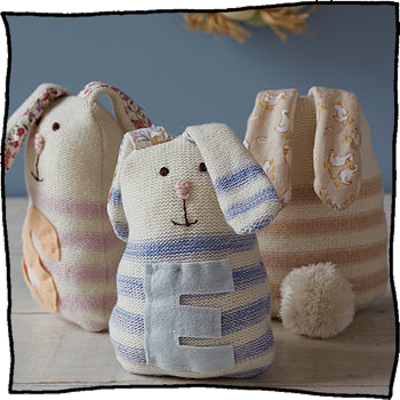 The bunnies are available in soft white with a choice of pink, blue or lemon yellow stripes. The fabric on the ears can be altered to suit a girl or a boy. Each Rabbit is beautifully presented in a gift bag. Use the box below to tell us your choice of initial. Dimensions: Approx. 18cms tall (not including ears). Enter any details here that will help us personalise your purchase.